Kanchan P. Kulkarni, MD, is a board-certified nuclear medicine physician at MedStar Washington Hospital Center. She has been a faculty physician at the Hospital Center since 2004 and has been the section director of Nuclear Endocrinology since 2008. She has also been an assistant professor of Internal Medicine at Georgetown University since July 2009. 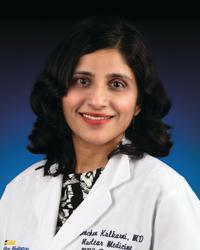 Dr. Kulkarni received her medical degree in Mumbai, India in 1999. She then relocated to the United States to complete her post-graduate training. She practiced nuclear medicine part time in a private radiology group at Frankford and Northeast Hospital in Philadelphia from 2006 to 2007. Dr. Kulkarni's philosophy of care is based on the idea of "patient first." She is committed to offering the best possible patient care using the latest technology, science, innovation and compassion. Dr. Kulkarni is sensitive to patient needs; she listens to and values all that her patients have to say. Dr. Kulkarni says that imaging is her passion. Nuclear medicine combines anatomical and functional imaging. This complete picture of the patient's issue allows her to make a diagnosis or determine whether a particular treatment is working. With nuclear medicine, Dr. Kulkarni can understand what's happening and confirm it with imaging. Dr. Kulkarni has a special interest in education and research. Her main research interest is nuclear endocrinology with a focus on nuclear thyroidology and the use of radioactive iodine for differentiated thyroid cancer. She has authored and co-authored multiple articles and abstracts, many of which are related to the use of radioiodine in diagnosis and treatment of thyroid cancer.